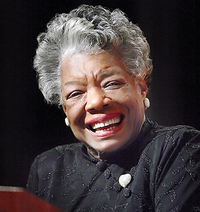 Dr Maya Angelou, an American author, dramatist, producer, historian, civil right activist and celebrated poet, was born on 4th April 1928 in St. Louis, Missouri. She is called to be the most influential female autobiographer of all time. Despite her brutal experiences of tremendous racial discrimination, her faith in her African-American traditions earned her fame across the world. She got scholarship to study dance and drama at San Francisco’s labour school. In 1954 and 1955, she toured Europe with the production of opera Porgy and Bess. She studied dance with Martha Graham and performed in various television shows. In 1957, she made her first record with her very first album Calypso Lady. After 1 year, she moved to New York and joined Harlem Writers Glide and acted in Jean Genet’s Blacks. The same year, she wrote and performed Cabaret for Freedom. In 1960, she worked as an editor for English language weekly, The Arab Observer; and later worked as a feature editor for the African Review and worked for Ghanaian Times. In 1970, with the guidance of her novelist friend James Baldwin, she wrote ‘I know why the cage bird sings’ which earned her national acclaimed and tremendous success. After which she wrote several fiction, non-fiction and verses. She is the author of 30 bestselling titles. In 1996, she directed her first featured film ‘Down the Delta’ and in 2008, she wrote award-winning documentary Black Candle.